Christmas is one of the busiest days of the year. When December falls, people are already rushing to specialty gift shops in order to find some stuff that can be ideal presents for their loved ones and visitors as well. With some financial crisis happening in our country today, it is very ideal to set a budget for your giveaways. You may also want to limit your giveaways to economical yet stunning ones. For kids, chocolates, cookies, candies and mallows can absolutely draw a magnificent smile on their face. Minus the toy due to limited budget, you can be confident that these sweets alone can still take their breath away. If you’re not a born chef, there’s no need to worry because there are a lot of ways to provide them these goodies without a single sweat. You just have to know the brand that your budget can afford and create a variation of presents from these. Before you pack everything, you should list down the names of your recipients first. Then, you can start boxing these goodies with affordable and cute holiday packaging and wrappers from baking specialty shops. You may also want to look for some usable materials in your house before buying. 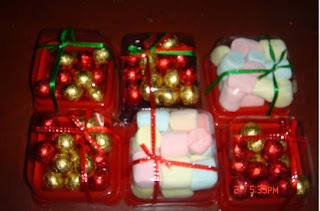 You can make assorted boxes of candies, chocolate, cookies and mallows or one for each box. Cute ribbons and your personalized gift cards will finish it off beautifully. Aside from it will be very convenient on your end, these type of giveaways will also let you buy just enough. It can also save you time from preparing a lot and money because there’ll be no excess. However, preparing few spare boxes will also be ideal so you have something to give to unexpected visitors. What you can put in the box can be a surprise for everyone. A combination of everything just as long as your budget permits you, these affordable yet sumptuous treats can simply turn your gifts into spectacular Christmas giveaways. It will not just make your recipients happy but it can also provide you with great savings and satisfaction as well. Here's some sample. At most, each piece will cost you less than $1.